Here is a slightly different more traditional approach. If you have a good idea that doesn’t involve hit chances please post, I am very interested. Make depth-scatter constant, and have the actor depth-aim to the depth of whatever the cursor centers on. Though there might be a bit of “randomness” through the scatter, it wouldn’t actually matter unless the shooter was being stupid and shooting the weapon outside it’s maximum range (as the depth-scatter should be such that if you actually aim AT the enemy at a reasonable range, they should be wide enough to catch the bullets). On top of that, you could also make it so that aiming at a player “ramps” to the depth of the player off of their surroundings; basically what I mean is that it shouldn’t be that accuracy is only achieved through placing the mouse on the exact pixel of the enemy, but rather that the further the mouse is from the target the less accurate you are, regardless of the angle of your gun. I think that the most important thing to do here is to think in terms of physical constraints, as an arbitrary admission will ultimately serve to undermine the system as a whole. Scatter in depth should act similarly to scatter in height; this only makes sense. What really bears consideration is rewarding through the actual AIM; depth-aiming if it is a game-play element should be affected through the user’s proximity to the right aim, just as height-aiming is. But this again should not be an arbitrary reward; it should not occur through simple pixel-hunting, as that is too finicky, and reverting to the Soldat system as long as the cursor is beyond the target is no less strange. Hopefully this makes some sense, I may attempt to clarify after retrieving some sleep. Instead of having a specific point to aim, the cursor is stretched out sideways (more horizontally oriented than vertically,) and the shots generally go in that plane, aiming around the center. That way vertical spread isn’t all awkward. In short, widen the scope. Because right now it looks to be playing sniper no matter what gun you have. I really like the idea of players being able to aim in depth. This is going to put down a lot of players I am afraid. A lot of players like to random spam a bullet rain upon their opponents. I tried to think of nice ways how you could achieve this but I wonder how it will work out if the players are in constant motion. It makes them kinda hard to hit, but the new idea your showing would workout better. First thing I wondered was, why do you want the players to be able to aim in depth? Are there objects etc that the players could hit for example? Or does it merely function as a feature? Also in the first picture where does the bullet go? What does it hit? Anyways I think the idea is great and its just something you need to play test I think. Maybe you could add a depth to the cross-hair, which swings between a positive/negative range while the player is moving for example. 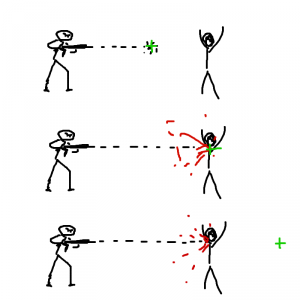 So if the player shoots, the cross-hair might be a little bit in depth and not on the same line with a player and thus the bullet moves behind the enemy. Crouching or prone for example would stabilize the cross-hair on a direct line with the player. Make it defined by weapon. A sniper rifle, zoomed in with perfect accuracy, would obey exactly the previous idea. This system could be used to make stealth very interesting, being able to hide in the background shadows without being sprayed to death. This would mean you could never shoot further than a screen’s length. If you do it, then you can’t allow widescreen support or much high resolution, as they would have an enormous advantage. This looks interesting. However, it would be really helpful first making three different versions and test them before setting something fix. why didnt you make the concept art yourself ? its so friggin good, all that detail, its insane actually! how about, if you move your mouse to the edge of the screen, and you posses a scope or a longrange weapon, why not move the player screen that way( kinda like zooming in with a FPS ). the negative side is, you cant see your character while doing this, making him flankable from all sides. In this variation is no reason to aim nearly, players will be aim in the edge of screen. And with aiming like this will no more spray. Sorry if somebody didn’t understood. @TLD I think it’s a good idea and I even wanted to propose something similar to it before but had no time. Now I’ll try to explain my thought. Soldier’s sight is already done, right? I mean, should look a little bit like those lights coming through the windows and doors in one of the first link-dead movies. But up to the point. When player wants to shoot outside his screen, he moves cursor to the edge. If there is some space (like long corridor), game should recognise it and allow player to look further in wanted direction. If there is a wall or something, aimpoint won’t move. It will hit an target (even if there is another body on the way) if you point your mouse on this target. If you point our mouse on nothing, the bullet will hit the first object that it encounter. The fact that you wouldn’t be able to shoot people not on screen kills this idea. I REALLY like FinDude’s idea: Make the shooting mode dependent on the weapon, allow all 3 ideas in the game. If you only allow the mode your presented above, it will result in all players always holding the mouse-cursor near the screen-edge and shooting, which is really gay gameplay-wise. The *can’t kill anybody outside the screen-range* doesn’t bother me THAT badly actually… but allowing multiple shooting methods will enable it for players who need/like it though. Each player should be able to pick his own style, right? Do the projectiles all have to be hitscan? for Hitscan weapons, use the original, unmodified, concept. For non-instant projectiles, Use the variation. A bullet fired short would hit the wall and miss, a shot aimed at the target would hit. A shot aimed beyond would miss. If the target were moving, it would be possible to dodge projectiles, but it would also be possible to blunder into them. It would become necessary to lead quickly moving targets much like a long distance sniper or fighter pilot. I would be for having the possibility to change that as a server setting as well. Maybe having the soldat ones for the more Action Like mode & the other one for more strategic & realistic ones. MM maybe you can also involve the “aim lag” system you made for soldat in here. It doesnt work out in soldat in my eyes but somehow Link Dead is a more realistic game and it might be a possibilty. So Maybe you have a 95% static aim cursor in the “area arround the target” and if you leave the area your cursor is getting to that “aim lag” thing. Don’t forget to make it compatible with a gamepad !? If a Soldat-realistic-equivalent is available in LD, and you can shoot through certain walls, you may know there is somebody past a certain wall but not see them, and it requires shooting through the wall. The idea applied here would mean you must move ur cursor at or past where the enemy is, despite how you don’t know exactly where he is, which just sounds strange in my opinion. I think you should just include hit chances. If someone gets in the way of whoever you are shooting at or within the range you are pointing, then they risk getting shot. That is how it is in real life. If someone wanted to shoot the stupid president and one of his bodyguards jumps in front of the bullet, the bullet isn’t still going to hit the president if the bodyguard is hit. Also, isn’t LD supposed to be one on one if I remember? How much does it matter if a bullet hits something else? So, if a Sniper is shooting you from a distance, you have no way to kill him? On another note: please, people, let the “hit chances” to the rpgs. If I shoot in the direction of a guy, I want to hit him, and not rely on some stupid random variable. 3) This system doesn’t bring ANY advantage over the standard “Soldat” style. It doesn’t even eliminate spraying; actually, it will be harder to kill sprayers (they will be just shooting to the edges of their screens, and to fight back you’ll need to walk into their line of fire). In my opinion, this idea would be only good if there was a need to shoot the background or something.